Mayflower Bible Lessons are ideal for Sunday Schools and church clubs. They provide pictures to colour, puzzle pages and other activities for children – and notes for teachers to use – alongside passages from the Old and the New Testaments. The lessons have been written by Sunday School teachers for Sunday School teachers. They’ll help to save you time and help to ensure that Bible teaching comes across in a clear and interesting way for children. Our Sunday School resources are creative and unique! We include pictures to colour – and there’s crafts too. 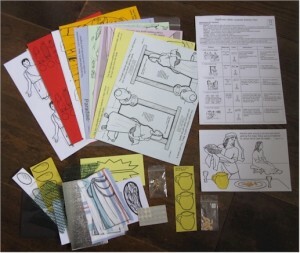 Packs also include extra items to cut out, arrange and stick in position – to make Sunday School resources more engaging for children aged 4-7. Meanwhile, we have Puzzle Pages for children aged 7-11. There are 16 series available, mostly with 12-13 lessons in each series. Please note: From October 2017, we’ve raised some prices slightly. Please note, Mayflower Bible Lessons can sometimes take 1-2 weeks to package and post as we have to hand-pick and customise orders for each customer.